At Direct Ferries you can compare all Ferries to Koh Tao Island to make sure you get the best deal on your trip. We currently offer ferries to Koh Tao Island on around 3 ferry routes with a choice of up to 21 sailings weekly. 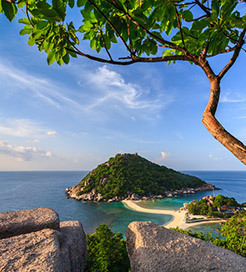 To get a ferry price and to check availability for ferries to Koh Tao Island, please select your place of departure from the menu to the left and hit search! For more information, please visit our Ferries from Thailand to Koh Tao Island page. For more information, please visit our Ferries from Koh Phangan Island to Koh Tao Island page. For more information, please visit our Ferries from Koh Samui Island to Koh Tao Island page.